City College Vaquero Jacque Ortegon (No. 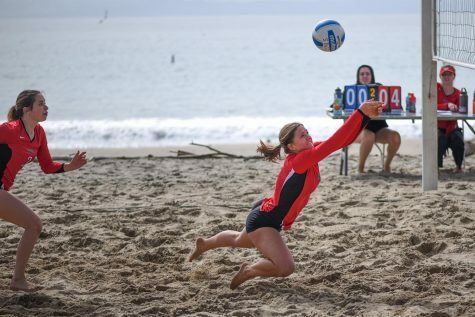 7) saves the ball from College of Marin on Tuesday, March 19, 2019, at East Beach in Santa Barbara. Ortegon and her teammate Emma Esparza defeated Krista McKee and Amanda Proctor 21-11, 21-9. 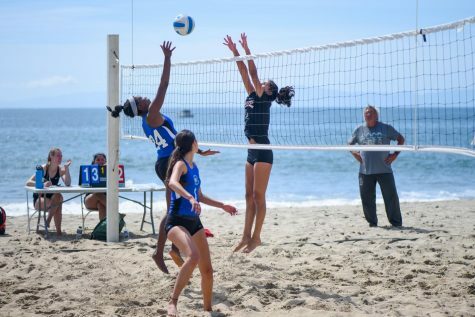 An improved City College beach volleyball team fell short of winning their first game of the season at East Beach on Tuesday. 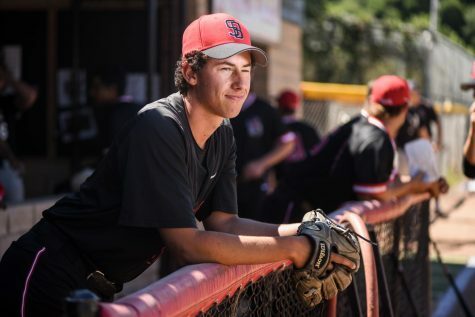 The team lost 3-2 to the Marin Mariners. 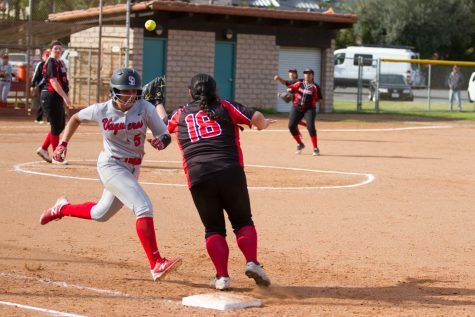 The Vaqueros are now 1-4 on the season, but the team is still finding its chemistry. 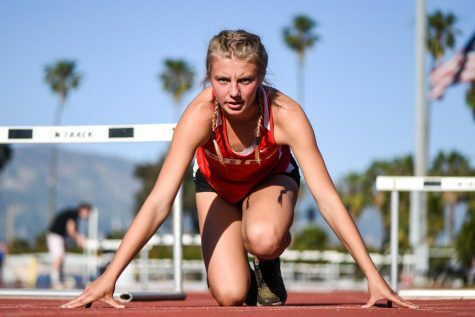 “With experience comes confidence,” head coach Samantha Calisto said. Many players on the team are experienced indoor players but are unfamiliar with beach play. The spacing is not quite there for them yet. 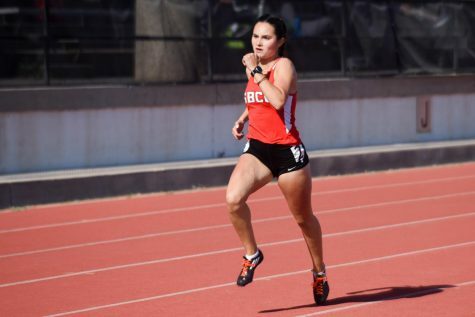 The highlight of the day came from City College duo Jacque Ortegon and Emma Esparza, who dominated versus Marin’s Krista McKee and Amanda Proctor. The duo won both sets by double digits, 21-11 and 21-9. Ortegon and Esparza played their first game together almost three weeks ago on March 1, and have become much more consistent since. 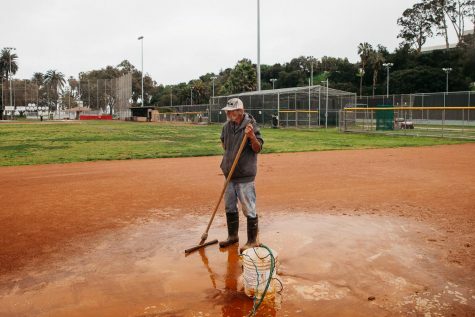 “We’re forming a better connection,” Esparza said. Alejandra Leon and Sarah Harris of Marin defeated City College’s McKenzie Garrison and Grace Trocki in the number one match, which sealed the loss. The first set was dictated by Marin winning 21-12. The second set was more neck and neck with the game tied at 11, but Alejandra Leon iced the set and the entire game with back to back kills. The final score was 21-15. Match four ended up going to a third set, but was closed out by Marin players Nattasia Farrin and Luisa Ayala, 15-6. The first set was lost 21-13, but Maddie Meyer shined in the second, willing the duo to a 21-11 victory. This was duo Maddie Meyer and Annie Rodgers’ first match together. 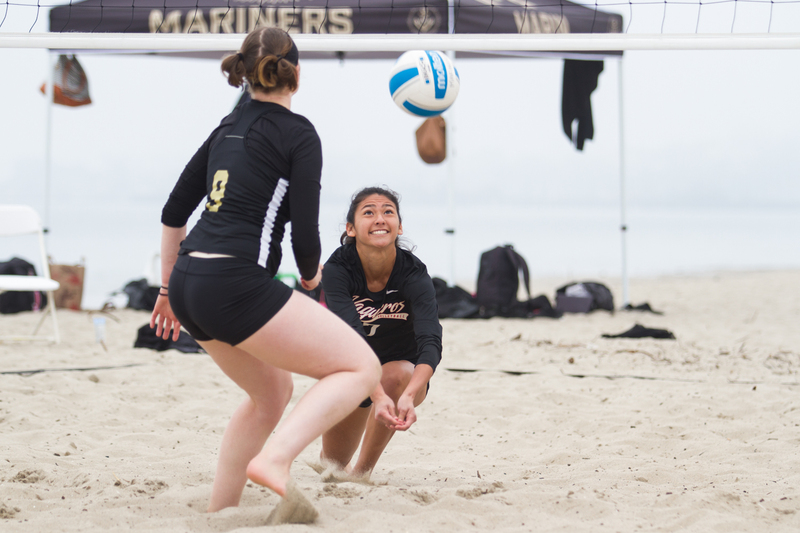 Marin players Ashley Chanthongthip and Maggie Johnson also capitalized in the third match versus Vaqueros players Michelle Orgel and Lily Eves. They won the first two sets. The fifth match was forfeited by Marin due to lack of players. “We still need to see what chemistry works best on the court,” she added. 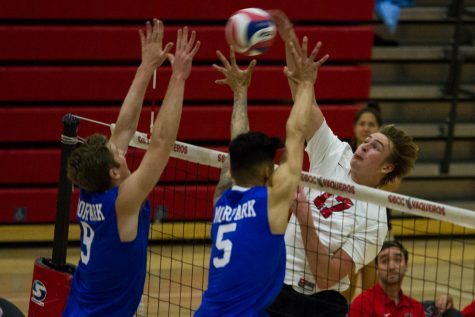 The team plays back-to-back games at 10 a.m. and 12 p.m. on Friday, March 22 at East beach versus Moorpark and Santa Monica.